Piano is not only a beautiful and versatile instrument, but a fundamental skill for any musician. 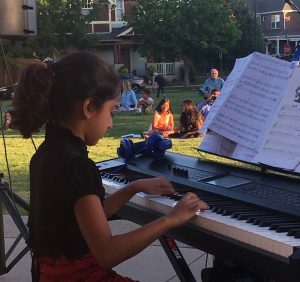 Through comprehensive piano lessons, ABC Music Academy students learn basic music theory, piano techniques, and vital performance skills that can be applied to any style of music. ABC Music Academy has more than 30 years of experience in vocal training and has helped hundreds of children expand their range, learn healthy singing techniques, and develop the performance skills necessary to really shine on stage. 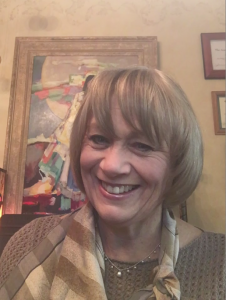 Our amazing voice instructor, Catherine Merritt Paden, works with our students to develop a full vocal range and develop a deep love for technique and performance. A beautiful sounding instrument, the flute is a great woodwind to start learning while young. It is commonly used in classical music, jazz, and even rock music. ABC Music Academy’s flute instructor has been playing the flute for decades and has won multiple awards. The flute is a key part to any band and we work to teach our students its great importance. At ABC, we work with our flutists to develop any desired skill level, even working on skills that are necessary for high school marching band. In classical jazz, rock, blues and more — guitar-playing is a skill that is extremely versatile. 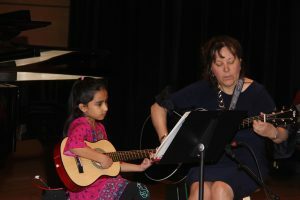 ABC Music Academy has experience in all styles of guitar techniques and would be glad to help your child form a love for this popular instrument during music lessons. When your child participates in music lessons from a young age, they develop meaning social, academic, and physical skills. At ABC Music Academy in Westminster, we approach music lessons as a form of enrichment, fun, and learning. We pride ourselves on creating positive learning environments for all kids! To learn more about our music class philosophy, contact our team today! Music classes development the coordination, spatial reasoning, and motor skills that prepare children for other activities, such as dance and sports. Learning a musical instrument boosts the math and logic portion of your child’s brain. Music lessons are like math lessons: beat, rhythm, and scales are all forms of patterns and fractions. Improved short- and long-term memory results from performing songs. Participating in music classes strengthens your children’s language development pathways. SAT scores of students involved in music are statistically higher than those who were not involved. Learning a new skill requires patience, self-discipline, and a growth mindset. Children manage performance anxiety and self-esteem issues. Music lessons give meaningful peer-to-peer interaction. If your child is interested in piano, guitar, voice, or flute lessons, sign up with ABC Academy in Westminster! We believe that music classes should be enjoyable, educational, and positive. Call us today for more information!